This stunning 5-bedroom, 6-bath 2-story modern custom home is situated within Sixth Avenue West Estates. The property is close to the Estates Park and tennis courts that offer spectacular views over-looking downtown Denver to the east & mountains to the west. 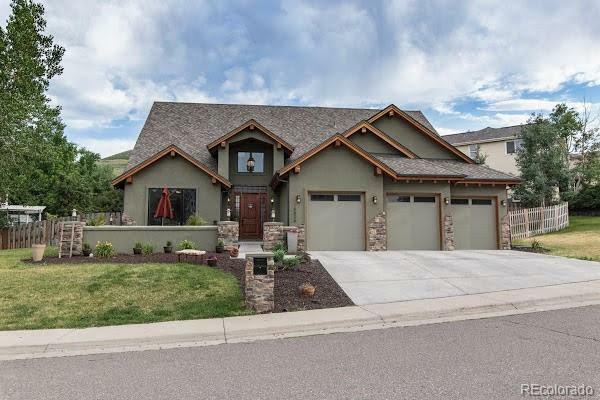 Has grand entrance w/stunning hardwood floors in main entry, great room, nook, & kitchen with two-sided gas stacked stone fireplace as the focal point. Main level master suite w/built-in closet system in master with his/her closets & radiant heated floors in master bath & main level guest bath. Unique modern metallic stair well, including an open catwalk above the great room. Gourmet kitchen with self-closing 42â custom cabinetry, convenient breakfast bar w/ambient pendant lighting, rustic slab granite countertops, HE high-end stainless-steel appliances w/incredibly quiet dishwasher, gas cooktop w/modern sleek hood, pocket doors between kitchen and laundry room & between laundry room and mud room, and under cabinet lighting.